The first couple of days in this school year symbolize and important step for SCSD #1. 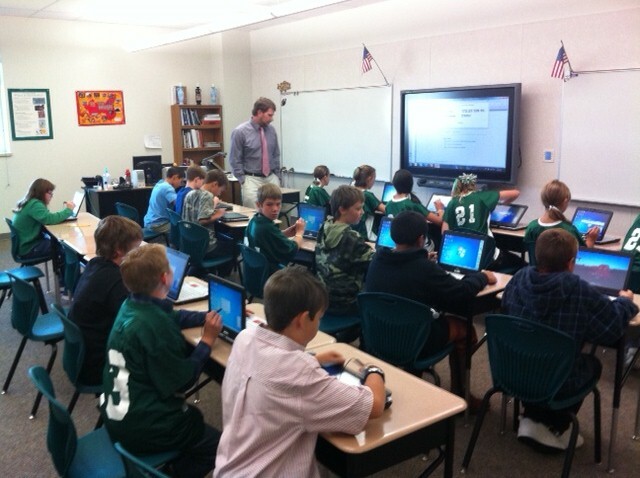 We have three classrooms that are beginning to pilot 1:1 computer access for students. The district has a goal of providing every students 1:1 access in the next 3 -5 years. In the pilot stage, this means that every student that enters these classrooms will have their own mobile device as a means to facilitate and enhance instruction. Each year it is our intention to implement additional classrooms that can provide 1:1 access based on the capacity of our infrastructure and technical ability of our teachers. As we increase the number of classrooms in each building and grade level, we will begin to transition to 1:1 access that includes providing each student with their own mobile device that they will take with them to each class. I’m extremely excited about this new direction and goals we’ve set for our district in an effort to ensure our students graduate with the technological skills they need to be successful, but I think it is also important to emphasize that the function of this technology is to engage students and enhance and facilitate learning. Technology has always been and always will be a tool, not the job itself. As such, SCSD #1 is investing as heavily in improving the quality of our instruction as we are in the tools that support it. We are adopting a unified instructional framework based on the nine instructional strategies teachers use that research has shown to have the highest impact on achievement for all students in all grade levels in all subject areas. And we have aligned our evaluation, monitoring and leadership practices to this framework and the supporting research. So while our new computers and SMART Boards tend to make a big splash, and I’m very excited that we are adding these new tools to our toolbox, I’m even more excited about where our teaching and learning is headed. It is in fact THE JOB, not just one of the tools. So while we know the importance of technology; and we will always strive to be in the forefront of technology integration, we know that job number one is the job itself. No amount of high-tech tools will build a quality house without the knowledge of a master builder. Another step forward. Another positive building block in the foundation of creating a professional learning environment for our children that will allow them to compete and succeed after they leave our 4 walls. Thanks Jay for working to make this happen.